There's a lot of love around us in the air… maybe too much! Valentine is nearing in. Behind love there’s always a sweet, gentle reward and happiness...or, a heartbreak. Your goal for today is to pick a combination on the following map. Each heart on the map has a specific reward behind it, however, some hearts may throw you in the friend-zone, where the reward is x3 friendship gems! May the best of luck be with you. 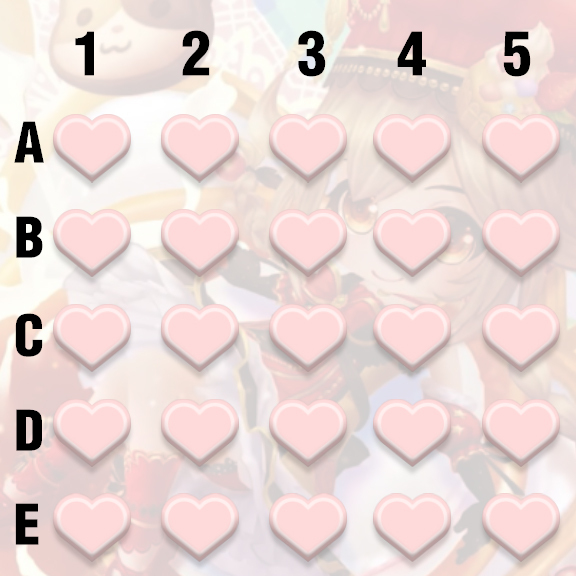 For example, if I wanted to pick the 3rd heart on the 2nd row, I’d say “B3”, or “3B”. Either way works, just make sure to include both a letter and a number shown on the map. Pick a letter and a number, or a number and a letter to indicate which heart you want to choose. If you wanted for example the 2nd heart on the last row, you’d say “E2” or “2E”. One entry limited per account. Participation is only allowed during the time-limit. Include your Aeria Games account and In-Game username in the post. It is fine for people to have the same pick.